Bagrak is an Orc warrior living in Mor Khazgur. She is the daughter of Sharamph, and thus the sister of Chief Larak. 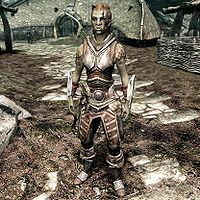 She wears a leveled set of heavy armor and wields a leveled bow with arrows and a leveled war axe, all of which may also be up to Orcish in quality. She also carries a pair of ragged trousers, a selection of common items and gold and carries the key to Larak's Longhouse. She may refer you to her mother, saying, "You should see my mother, Sharamph, if you need a cure or a poison." She may also tell you about the stronghold's blacksmith, Shuftharz, saying, "Shuftharz can forge you some armor, outlander." She will comment on Chief Larak with, "Larak is strong, but he has much to prove as chief." She can bless you with, "Malacath protect you." The game data lists Bagrak as InLawGrandchild of Sharamph and as spouse to Larak, leading to some confusion. This page was last modified on 23 February 2018, at 21:25.